The adventurer. The all-new Honda Passport was designed to get dirty. From mountain trails to muddy excursions, this SUV is willing to go the distance. Advanced driver assistance and safety technology means that whether you’re taking the Passport off-roading or on a road trip, you and your loved ones can feel safe. With seating for up to five passengers, and plenty of cargo space, you don’t have to leave anyone behind while you’re out exploring. Honda has equipped the new Passport with a 3.5-liter V6 engine with i-VTEC® which produces up to 280 horsepower and 262 pound-feet of torque. A 9-speed automatic transmission is paired with the V6 engine to ensure smooth shifting and optimal fuel performance. That power is translated to the asphalt (or the trail) through Intelligent Traction Management. The system helps you maintain optimal traction and comes standard on models with both front-wheel-drive and all-wheel-drive, so even if you opt for the front-wheel drive Honda Passport, you know you’re always getting the best traction possible. 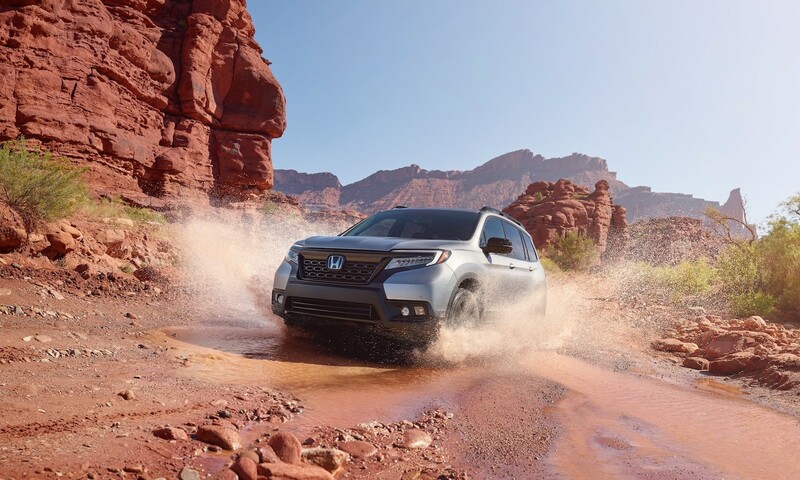 However, if you do choose the all-wheel-drive version, you can choose Honda’s remarkable i-VTM4™ all-wheel-drive system to work in concert with the Intelligent Traction Management and always send the right amount of power to each wheel, making the Honda Passport a formidable off-roading vehicle. While the new Honda Passport may be the brand’s most capable SUV yet, Honda didn’t skimp on the technology features either, including some of the newest and most coveted options in the industry. Available Apple CarPlay® and Android Auto™ connect seamlessly to the standard 5-inch or available 8-inch touch screen display to deliver premium sound through the Passport’s standard 152-watt 7-speaker audio system. Upgrade your listening experience with the available 590-watt 10-speaker audio system for unforgettable sound quality. The instrument cluster is displayed beautifully on Honda’s Thin Film Transistor (TFT), which not only displays vital vehicle information like speed, but can also be customized to show whatever information you select, so everything is in one place. Audio system information, your cellphone’s information, and navigation can all be conveniently displayed in the cluster, so you don’t have to take your eyes too far from the road. 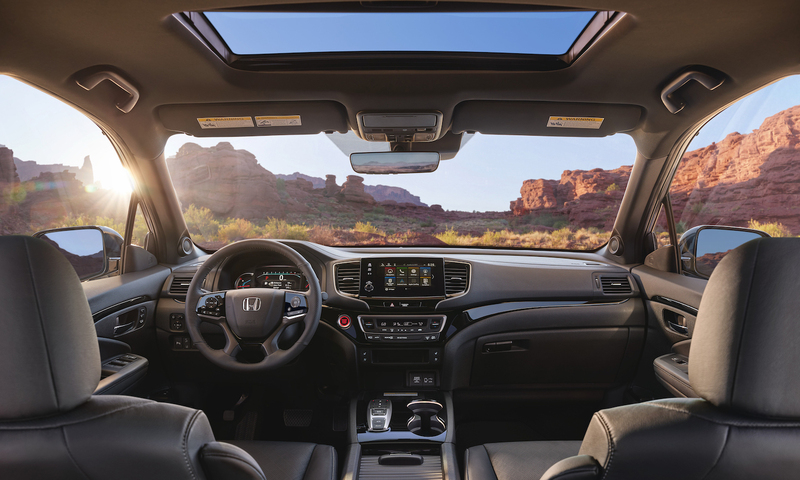 Honda cares about keeping you and your passengers safe on the road, and that’s why the automaker has made the Honda Sensing suite of driver assistance technologies standard on all trim levels of the all-new Honda Passport. The Collision Mitigation Braking System™ (CMBS™) featuring Forward Collision Warning (FCW) monitors the road ahead to predict possible collisions and even brake when you don’t have time to react. 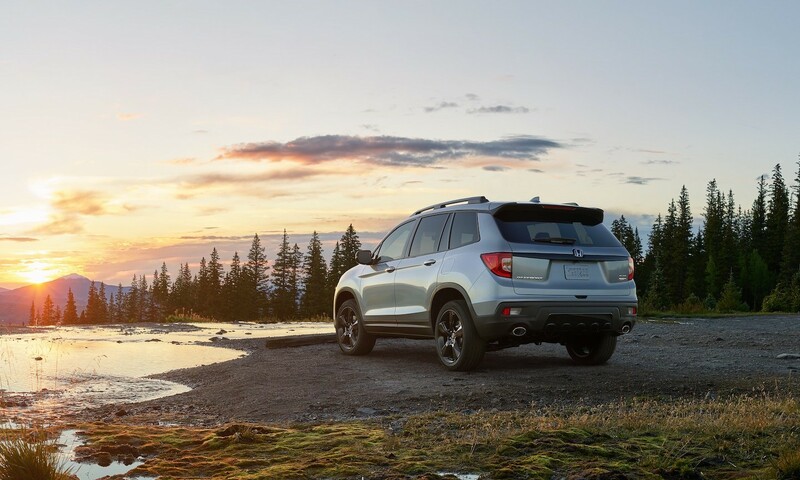 Road Departure Mitigation (RDM) including Lane Departure Warning (LDW) helps keep you on the road until you’re ready to take the Honda Passport on an off-roading adventure. Thanks to Lane Keeping Assistance System (LKAS), the Passport can make gentle steering corrections if you stray from your lane. Road trips are simplified thanks to Adaptive Cruise Control (ACC), which can not only be set to a specific speed, but can also maintain a preset distance between your Passport and the vehicle in front of you. 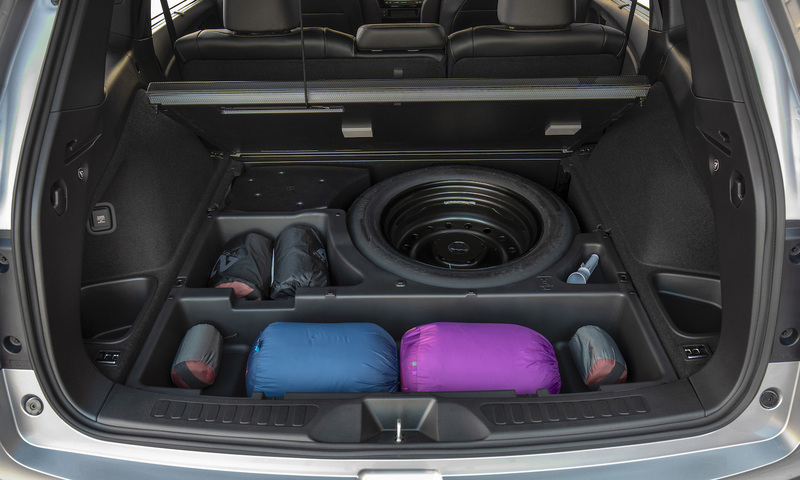 Want the space of an SUV in an overall size that’s more city-friendly? Check out the Honda CR-V. This crossover features the same Honda Sensing safety suite, available all-wheel-drive, and a gas sipping powertrain. Need a little less sport and a little more utility? The Honda Ridgeline fits the bill, offering the hauling ability you need and the full functionality of a pickup truck. The Honda Passport is just one of the exciting new things in the Honda lineup for 2019. To schedule a test drive or learn more about this impressive SUV and other great Honda models, please contact 3 Birds Linking today or visit us at 505-B West Franklin Street, Chapel Hill, NC 27516. * MSRP excluding tax, license, registration, $1,045.00 destination charge and options. Dealers set own prices.